By improving the features that characterised the great success of the well-known Studio Due CityColour IP33 / IP54 our technicians have projected a little and complete range of products which can meet with all the requests and needs to light up outdoor and indoor big surfaces: theatres, discos, parks, town centres, castles, sport facilities and so on. The numerous color shades achievable through the three filters can make the best of any lightened object. The three fixtures that compose this little line differ in the power of the lamp and the IP RATE. Two of them use Philips 1800W lamp, while the new Osram 2500W is used on the third: the various powers available can allow, also thanks to a particularly efficient optic system, to even enlarge the possibilities of use of these fixtures. The IP RATE is 33 or 54 according to the version, and this makes it possible to choose the most appropriate model according to one's needs: for fixtures used in a not particularly critic environment, it is possible to take off the filter and make the IP RATE change to 44, which is the standard value for most applications. In the new models all the functions for the setting of the fixture can be programmed from the menu through the keys, and without using any switch or mechanic elements: all the options are shown on the display thus making the programming fast and simple. [read more...] Fifteen programmes are already stored in the memory of the fixtures which can therefore be used also without remote controllers and in synchro mode with Master/Slave setting. 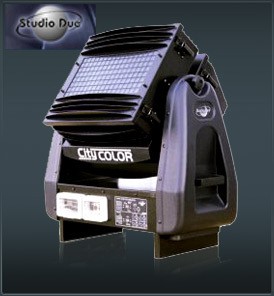 It is also possible to make a custom use of the fixture through the DMX connection, by using a remote controller to create any kind of color games. CYM color changer with high resolution stepper motors.